In a mortar, pound the garlic to a paste with the brown sugar and green curry paste. Add the lime juice, fish sauce and 3 tablespoons of water. Stir in half of the cilantro and mint. In a small bowl, whisk the mayonnaise with 1 tablespoon of the green curry dipping sauce. Fill a pie plate with warm water. Dip 2 or 3 rice paper wrappers at a time in the water, then set them on a work surface to soften, about 1 minute. Spread a scant teaspoon of the curry mayonnaise on the bottom third of each wrapper and top with a scant 3 tablespoons of the roast beef filling. Roll the wrappers into tight cylinders, tucking in the sides as you go. Transfer the rolls to a plastic wrap–lined baking sheet and repeat with the remaining wrappers, curry mayonnaise and filling. Just before serving, cut each roll in half and serve with the dipping sauce. 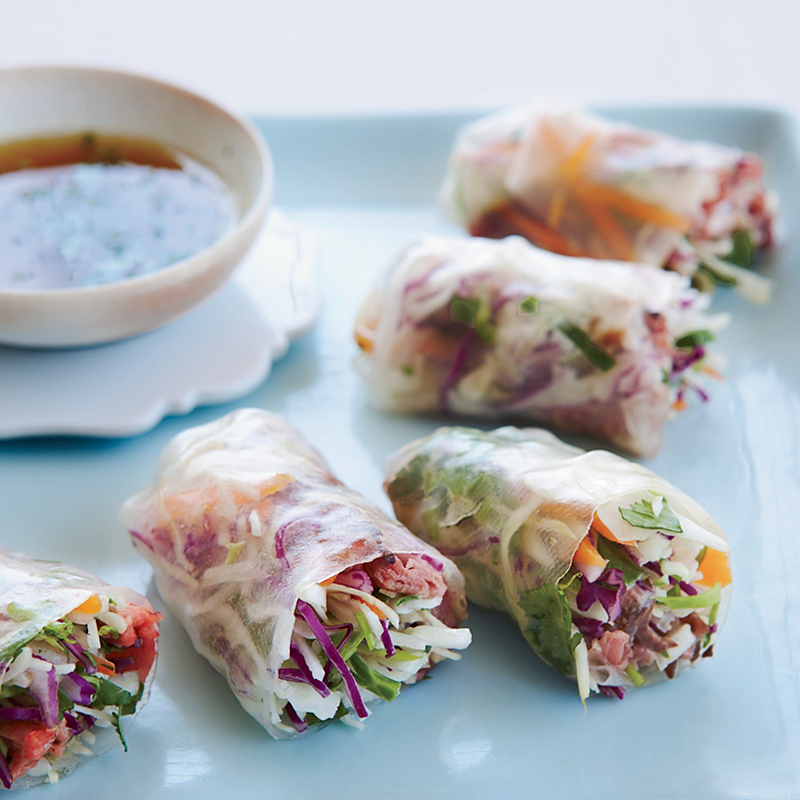 These light, tangy, herby summer rolls pair best with a substantial white wine. Try a Rhône-style white from California's Central Coast. Review Body: This is an atrocity to Vietnamese food.